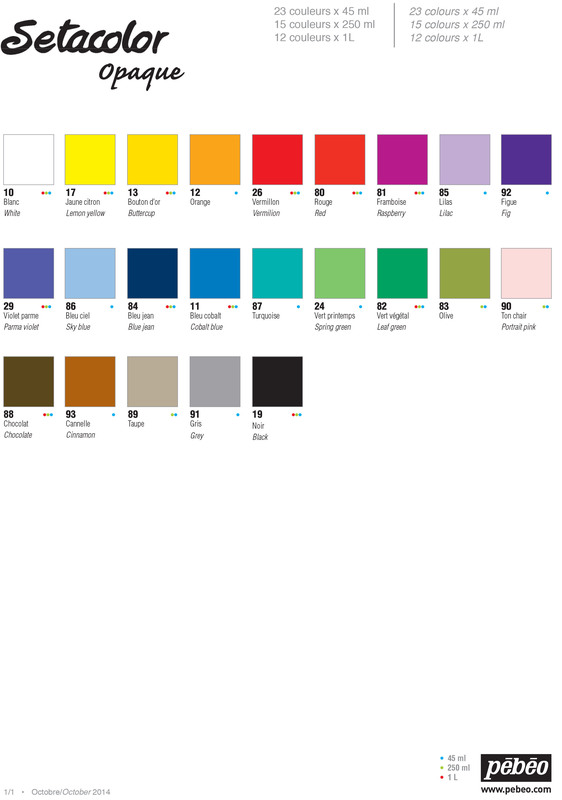 Pebeo Setacolor Opaque Fabric Paint is a water-based colour for decorating dark, light, thin or thick fabrics. With a high covering strength, the colours are intense and vivid – colours can be mixed together or used with Setacolor Auxiliaries to achieve new effects and colours. Excellent lightfastness. Air dries in 1 hour. To fix colours, iron on reverse side of fabric for 5 minutes or in the oven for 5 minutes at 150°C. After fixing, colours resist machine washing at 40°C (100°F) and hand washing. There are 20 colours to choose from. 45ml bottles.